Confused by Pokemon Go's raid battle rewards system? Don't worry; it's not as complicated as it seems. Pokemon Go players have been earning rewards for various raid battles for a while, but aside from knowing which items raid battles give -- Golden Razz Berries, Technical Machines, and the like -- no one really knew how many items to expect as raid battle rewards. Fortunately, those days of ignorance can be put behind us, as the fine folk over at the Pokemon Go-based Silph Road website have done some research and came up with some interesting finds regarding raid battle rewards and a previously-unknown reward multiplier. Read on to discover how raid battle rewards and reward multipliers work in Pokemon Go. Research done by The Silph Road has confirmed many players' suspicions: raid rewards are indeed doled out in multiples of the same item. These reward bundles have different values: for instance, Revives are given out in bundles of 5 for completing level 5 raid battles, but Technical Machines, both the Fast and Charged types, are only ever given out in bundles of one. More importantly, the number of items in each pack are determined by the level of the raid battle. It likely goes without saying, but the higher the raid battle level, the higher the reward. For instance, level 1 raid battles have a chance of dropping two Revives and/or one Golden Razz Berry, Rare Candy, Potion, and Technical Machine; on the flipside, level 5 raid battles can drop five Revives, three Golden Razz Berries, three Rare Candies, and/or one Charged or Fast Technical Machine. 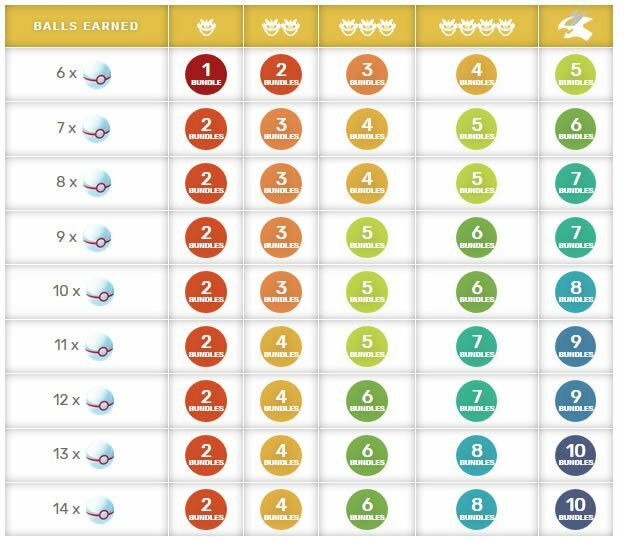 For convenience, The Silph Road has provided the above chart as an easy reference for various raid battle level rewards. "Successfully completing a Raid for the minimum of 6 premier balls will allot reward bundles equal in number to the Raid level. Earning more premier balls (up to the maximum of 14) by controlling the gym and dealing personal and team damage increases the number of reward bundles, up to double of what you get for only completing the Raid." 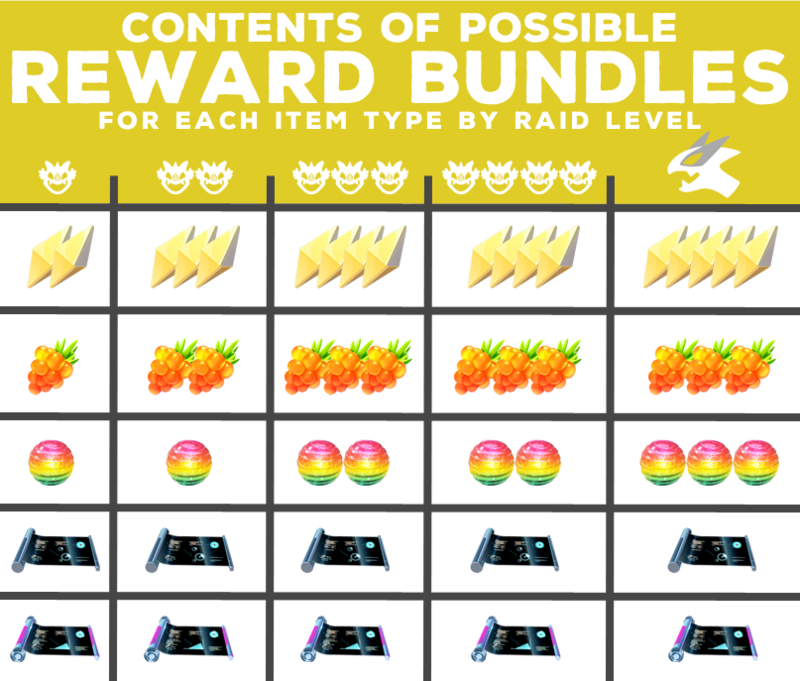 The team has also provided another graphic detailing how reward bundles can be doled out in relation to Premier Balls and raid battle levels. Do note that as of yesterday, Pokemon Go has introduced Potions, the update for which seems to have bumped down the rewards for level 5 raid rewards. There's one more factor that influences various raid rewards outside of bundle multiplicands, raid battle level, and the number of Premier Balls on-hand. Perhaps unsurprisingly, it's luck. The system is straightforward: lower-tier reward bundles, like Revives and Golden Razz Berries, are doled out less often in higher level raid battles. And, as might be expected, higher-ter rewards are also doled out more frequently at higher level raid battles. However, the chances of earning any reward can be influenced by a luck modifier. Luck only really comes into play with regard to an increased or decreased chance to receive a given reward: across all raid battle levels, the luck modifier decreases as raid battle level increases. For example, with a level one raid battle, luck provides a +/- 1.0% change to the chance of earning a Fast Technical Machine; at level five, the modifier decreases to +/- 0.5%. Things are similar for Revives, where luck provides a +/- 3.7% modifier at level one and +/- 1.0% at level five. The bottom line here is that players will note increased luck modifications at lower-level raid battles and decreased luck modifications at higher-level raid battles. Given that the statistics for more and better rewards increase as raid battle levels increase, luck understandably plays a decreasing role; after all, it only makes sense that players might get lucky and earn a high-level reward for a low-level raid battle, but players would be disappointed if Lady Fortune took away their chance for a high-level reward. As always, the research provided by the team behind The Silph Road is frankly peerless, and players can check out more details of their research, included how the newly-included Potions interact with the reward structure, by heading over to the Silph Road website. Looking for mure clutch Pokemon Go information? We've got loads of how-tos, strategies, tips, event details and more featured over on our Pokemon Go tips and tricks guide hub.